Following up: oh those circles! … and some people ended up even more confused. So let’s hit a few more key points even though this is Monday and not DNA Sunday. Key point #1. You have to pay for Ancestry to get the full use of your DNA results. It kinda goes without saying, y’see, that Ancestry is a subscription service. So where companies that only do DNA testing don’t charge subscription fees, AncestryDNA does, and has done so since November 2014. If you want to have hints to shared ancestors and be able to contact matches and to have DNA Circles and NADs and be able to see the trees of your matches and other Ancestry subscribers, you have to have an Ancestry subscription. Those come in a number of flavors (and price ranges) but there’s one Ancestry doesn’t tell you about very much unless you ask … and you can’t get it unless you call Ancestry and ask for it. It’s called Insights, it’s the least expensive at $49 a year, and it’s explained here. But as far as I can tell, the only way to add an Insights subscription to a DNA test is to call Ancestry and order it. But notice that there aren’t just two members to the Circle. There are more that the highlighted person on the left doesn’t share DNA with (the person on the right did share DNA with those others, or there wouldn’t have been a Circle created). So the rule that says there have to be three people that share DNA to have a Circle only applies to getting the Circle started. Once it’s been created, others may be added to it even if they only match one person in the Circle. But it may not be a very strong piece of evidence, especially if the Circle itself is small. If you want more on the technical background of Circles, AncestryDNA has an entire White Paper that you can read. You get to this by clicking on the List side of the boxes above the circle (or the list) instead of the Relationships side (and you switch back to the circle by clicking on the Relationships box). Here you can see who is actually a DNA match to you (the people who share DNA with me are shown in orange) and those who only share DNA with someone else in the Circle (those are shown in blue). 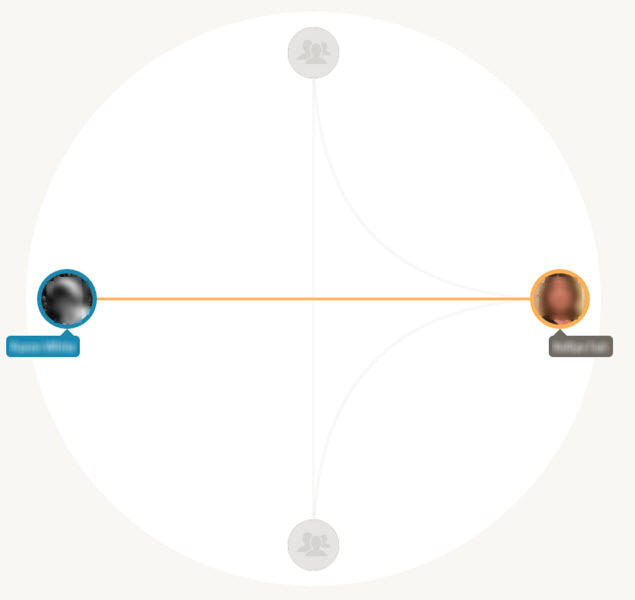 You can then click on the View Relationship box to explore this further — and that works with both Circles and NADs. And when you explore this further, you find out just how much of a crap shoot it is to be placed into one of those NADs. For example, I’m in a NAD for Zachariah Taylor, born in 1860 in Illinois, died in 1920 in Oklahoma. There are 10 total members to the NAD (but only seven are counted because there are three two-member Family Groups), and I share DNA with three of them. Then click on that little “i” in a circle. See what it tells me? 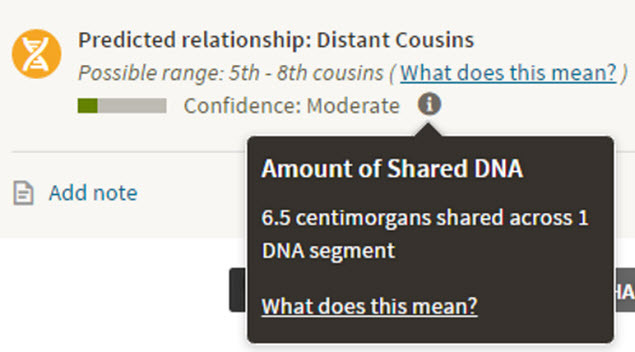 This is my strongest match to this NAD group, and we only share a single segment of 6.5 centiMorgans — a very very small amount of shared DNA and an amount that, quite frankly, could simply be a false positive. While I’m certainly not going to reject it out of hand, I’m not going to spend a lot of time on a 6.5cM match. Once again, take Circles and NADs as hints, and they can be very very useful. But remember their limits, too. I have a ton of DNA questions. To find as many possible matches I have tested with 3 companies (Ancestry, Family Tree, and 23&Me). While the tests are fairly similar, their not exactly the same. The most variation was in the 23&Me test and now 23&Me has redone my results and there are differences from the initial results. 23&Me won’t respond to my inquiry. 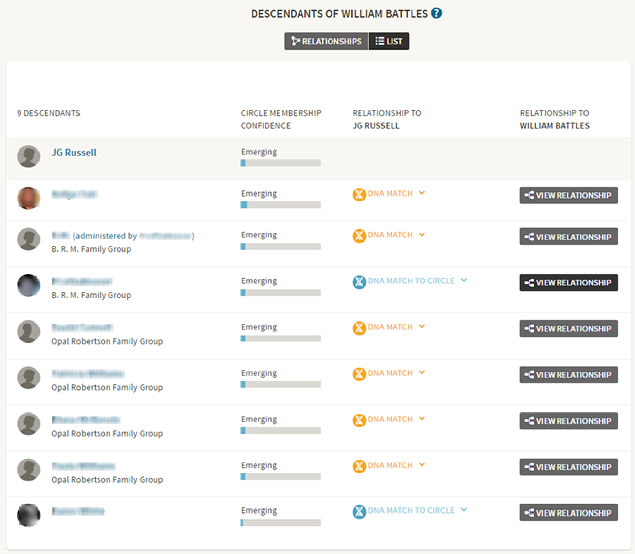 As to Ancestry’s Circles, I have given up trying to make sense of them. My brain is hurting. I cannot understand why I am not in a particular DNA Circle when it seems I meet the criteria for it. Your two articles have helped, but I’m not there yet. I’ll read the white paper and contact Ancestry. I do have a suspicion, and if it is what I think it is, the reason actually makes sense. I just clicked on the link you gave concerning Ancestry subscriptions. It no longer lists Insights as an option. Do you know if it’s still available via phonecall? It is available by phone.